Many years ago, the Star Elders told me that when we came upon the shift of the ages many basic rules of nature, regarding how our dimension works, would change. Because most ancient cultures have prophesied that we are now in the shift of the ages, it is essential that we keep our eyes open to changes around us. The changes we see, the feelings we have and the effects that we see in the world, are all clues to what rules are changing and when. 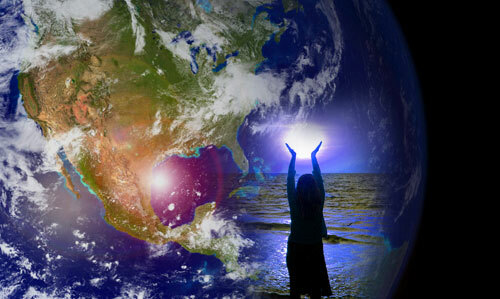 We have had in recent months, a massive wave of heightened light and frequency wash across our dimension. Because of this, the laws of nature, the very fabric of our old dimension, is beginning to dissolve. One aspect that is greatly affected is the rule of duality and separation. Duality and separation creates up and down, black and white, right and wrong, etc…. Duality creates separation, and separation creates duality. The interesting point here is that we have never been separate from each other. We have always been intimately connected, but we have been unconscious . . . like sleeping zombies. Thanks to massive waves of light coming into our dimension now, we are beginning to feel the impact that we are indeed connected to all life. What affects one, affects everyone. It is what the Maya call "In Lak'ech Ala K'in". This means what I do to you, I do to myself, and what I do to myself, I do to you. In Inca traditions this time is referred to as Taripaypacha (tah-ree-pie-pah-cha) with literally means "to merge with the universe". In Andean prophecy, this refers to a new Golden Age in the human experience. It is known as the age of meeting ourselves again, and heralds the coming together again of the Children of the SUN, and the recreation of a new and better world. The terrible earthquake in Haiti reminded us what post-traumatic stress syndrome actually feels like in the collective consciousness. Any time there is a huge trauma or displacement in the family of humanity, we all feel it whether we know it or not. Many people suffered feelings of suffocation, tightness in the chest, panic attacks, uncontrollable hunger, stomach and digestive issues and a pervasive numb/empty feeling. It has been hard to get moving, because we have felt stuck, trapped and frustrated. We did daily battle with relentless procrastination. Life has felt like life itself was circling in a holding pattern. We are still having strange dreams of the past, as we clear out our past issues once and for all. Even before the Haitian earthquake, humanity has been manifesting more and more physical illnesses; most of which are phantom symptoms that have more to do with the collective rather than the individual. The drug companies make more and more exotic designer drugs trying to help us deal with these imbalances. But the drugs have terrible side effects, and we end up being sick in another way. We are struggling to feel better, because deep inside we are becoming aware of the harmony, the balance, and the oneness that now exists in these new frequencies. But going into denial of these imbalances will give only a temporary reprieve, and prolongs the uncomfortable symptoms. We need to face the proverbial "bogeyman" inside of us so we can be free again. We do the best we can to deal with the ever increasing frequencies which we are feeling. So we numb ourselves so as not to feel this stress; not because we are lazy, but because we don't know what to do to fix the imbalances. The problem appears to be too big and overwhelming to comprehend. We learn to adapt the best we can. Most everyone on the planet can feel that something is desperately wrong. Our fright or flight / catastrophobia mechanism has been kicking into overdrive. Emotionally we try to numb ourselves with more things, more food, more sleep, more drugs, more spiritual practices, more meditation and more yoga. We are finding that there are not enough things to have, or things to do in the world, to ease the stress that we feel inside. We find ourselves still hungry, and searching for a better high. Nothing seems to work. Now that a little time has passed, we have already begun to assimilate and integrate the post-traumatic stress created by the Haitian earthquake. Even though it may not appear outwardly, we are working very hard to break through the veil to balance ourselves and our lives within these new higher frequencies which have arrived. We are learning to deal with what I call yet another level of the "new normal". As complicated and challenging as this wave of light appears, there is an easy remedy. Recently the Star Elders shared a simple suggestion to help us get through this wave, and those coming to us in the future. They simply said "KEEP MOVING". I didn't understand the impact of what they were saying until recently. Once I realized how stuck I was feeling, I kicked my backside into action. Believe me, I had to kick hard. I started moving. I did anything. It didn't matter what. I just moved. I worked in the garden and did some long needed home improvements. This didn't come easy, because I felt like I was hindered every step of the way. Even in writing this article, I hit more layers of procrastination than I wanted to count. But I persevered, and kept on keeping on. In my stuckness, I didn't want to go to the gym. But when I finally went, right there on the elliptical machine that I dislike so much, I was having fantastic visions. I was feeling the light of the new and glorious world unfolding in front of me. It was incredible and timeless. My allotted 30 minutes passed by in a blink. I didn't understand this, until my sweetie Raphael said "Remember, the Star Elders said to keep moving." Oh, he was right! I began to realize this phase of our ascension / shift of the ages, needed a deeper level of focus and commitment from us to make things happen. The deeper I committed to any desire or intent, the easier things became. As long as I stayed totally committed to making things happen, they did. But I couldn't do this sitting down. I had to move. I had to get involved. I had to do something. Soon my numerous post-traumatic stress symptoms began to diminish. As each wave of high frequency light reaches us, we will become more conscious and awake, and the more we will feel the pulses and shifts in the collective consciousness. This can be a pretty uncomfortable dilemma for ones that are already quite open and awake. An old friend told me once that the only way out is through. There is no going back to the way it was. We must continue with our awakening. We must keep moving. We cannot unlearn the light. Once we become fully aware that each and every one of our actions affects literally everyone else, it will become more important to us to live with impeccability, harmony, and peace. We are being called to live an authentic life. You know the old saying "What goes around, comes around". I began to realize that our feelings of being stuck related to the fact that our primal survival mechanism didn't want the "new normal" that was presented to us. Our spirits are eager for change, but the primal side of ourselves wants to hang on to the "old normal". The unknown is always a little scary, and facing 100% of ourselves can be detrimental to our ego. This is causing us the uncomfortable feelings, and the crazy and un-diagnosable symptoms. The old fading normal is arguing with the new normal birthing inside of us. This is simply duality rearing its ugly head, but it will fail. Duality is no longer being supported. The laws of natures based in separation and duality are now being replaced by the law of ONE. The age of US versus THEM is over. Because of this fact, our world appears to becoming more polarized and out of balance. It appears this way because we are more conscious of how intimately connected we all are. We are closer together now. We can see the hidden skeletons in the closet. Therefore, we are more aware of all the imbalances. It is not that the world is getting more out of balance. It is just that we are becoming more aware of what has been happening all along. The mass collective consciousness is out of balance with new laws of nature, so it is no wonder why so many of us feel like aliens. It is not that we are aliens to this world. It is because our world is alien to us. It is out of balance with the truth of the new laws of nature . . . the wave of light that is now growing within us. Example: You know when someone steps too close to you, and you have a feeling of your space being invaded. Well, these new higher frequencies have reduced the space around us to the point that everything is feeling too close and uncomfortable. We are becoming more aware. In time, our senses and perceptions will adjust to this new normal, and we will be one step closer to unity. When we try to support ourselves, we seem to fail, and we don't know why. This is because we are thinking individually, instead of collectively. If our motivation is self-serving we will begin to run into a great deal of roadblocks. If we want things to go well for ourselves, we also have to consider how our intent and actions will affect other people. If we are offering a service, not only does the service have to be offered with integrity, but also our motivation for doing it must consider the receiver. Greed is a form of duality, because greed thinks of only itself, and not the whole. We can see this aspect of duality coming to light when we watch the evening news. What this means is that we can't do things the way we used to, because it won't work anymore. Remember, what goes around, comes around. No one will be able to avoid the new laws of nature that have been put in place. The new laws of nature cannot be altered by wealth, status, etc…. In other words, you can't buy your way out of this one. Our eyes are opening. Because our eyes are opening, we will ultimately begin to bring balance back to the world. We can't become awake and stay out of balance at the same time. That would be dualistic. So if we can't stop our awakening, then balance will ultimately have to be restored. So welcome to the new normal . . . an age where we are ONE once again. We are all intimately connected by an invisible thread of life. This new phase of our ascension is about the law of ONE, and that means every-ONE. If we want to heal ourselves, we need to heal the whole. If one is out of balance, then a part of us all is out of balance. It is time to come together and realize that we more than just family . . . we are ONE. Not Self centered - ONE centered.